Well say goodbye at Germany having a shot at the WC next year. "Indispensable" and "Podolski" in one sentence? The only time that one would be logical would be "Podolski is not indispensable". Inb4 "old joke is old" and similar responses. Germany manager Joachim Low believes that Mesut Ozil's late transfer to Arsenal will benefit the national team as well as the player. The 24-year-old joined the Gunners on transfer deadline day for a club-record fee of £42.5m from Real Madrid, and signed a five-year contract with the North London outfit. Low feels that Ozil will thrive under the tutelage of Arsene Wenger, as well as playing alongside some of his international teammates. "What I've heard the last days before this transfer, is that this trust had disappeared in Madrid," Low said in a press conference. "Arsenal and Wenger put a lot of effort in to get him, which did him, of course, a lot of good. "That's why I think personally for us, for the national team, it's a good transfer. Arsenal is a good club, with a top manager and also two German team mates, [Lukas] Podolski and [Per] Mertesacker. "Arsenal also play great football, technically on a high level, and I think that plays into Mesut's game." It's amazing how Germany let in 7 goals in two matches against Sweden and yet came out with 4 points. Video analysis of the two Sweden games is a must for any coach seeking to beat Germany in Brazil. This morning I've read that England wants to play a friendly vs the National Elf this November! The game vs Italy has been confirmed for Nov 15. So there is a possibility that Germany might play both Ita & Eng in one week. Germany has a lot of talent but relatively few center-forwards. Going into the campaign, the continued reliance on Miroslav Klose, who’ll be 36 at next year’s World Cup, was seen as one of the team’s weak spots. There’s also Mario Gomez and Gladbach’s shooting-star Max Kruse, but that’s it, really, considering Joachim Löw doesn’t like or rate Stefan Kiessling from Bayer Leverkusen. 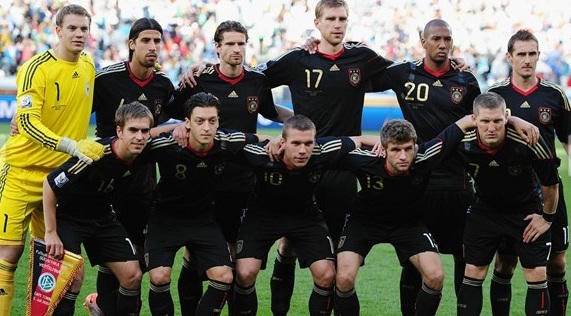 This Germany team doesn’t look like it needs strikers anymore, however. Out of 36 goals in the qualification (a record in the European section), only four were scored by a recognized forward (Klose)[\b]. The other [b]32 have come from wide players (Reus, Schürrle, Müller), “false 9s” (Götze) or playmakers/no 10s (Özil, Gündogan, Kroos), one central midfielder (Khedira) and a central defender (Mertesacker). Löw must be extremely pleased. Not only can his team play without an orthodox no9, it has also stopped being dependent on any one specific player altogether when it comes to goals. It’s hard to think of a Germany team going into a tournament with so much scoring prowess. 32 from wide players is a very interesting stat there, esp. in the light of strikers scoring only 4 goals all through Klose. Low has signed a two-year contract extension till euro 2016. Still very likely he'll get sacked if Germany endures a disappointing WC. unknownsoul wrote: Low has signed a two-year contract extension till euro 2016. Still very likely he'll get sacked if Germany endures a disappointing WC. If Germany don't win the WC, then a change should be made. No idea what's got into DFB. If they fire him next summer, why would they want to pay him off? They should have waited until the WC was over. Does anyone know if they will change the jersey for the WC? I am not very found of the current one (even thou I got one).